Adjust the height so that your hips are level or higher than your knees. The whole of your foot should be on the floor, do not lower your chair to suit the desk height. Raise the desk! Ideally the seat pan would have a rounded ‘waterfall’ padded edge to avoid pressure on the back of the knees. Adjust to accommodate thigh length. With your back fully contacting the back rest there should be a gap of about the width of your fist from the edge of the seat pan to your knee. Arm rests are not always necessary. Incorrect use can cause problems. If provided arm rests would ideally be height, width and depth adjustable and should not prevent you from sitting close to your desk. The height of the lumbar curve differs from person to person, so adjust height to accommodate your individual body shape. The back rest of the chair should allow recline angle of at least 150. 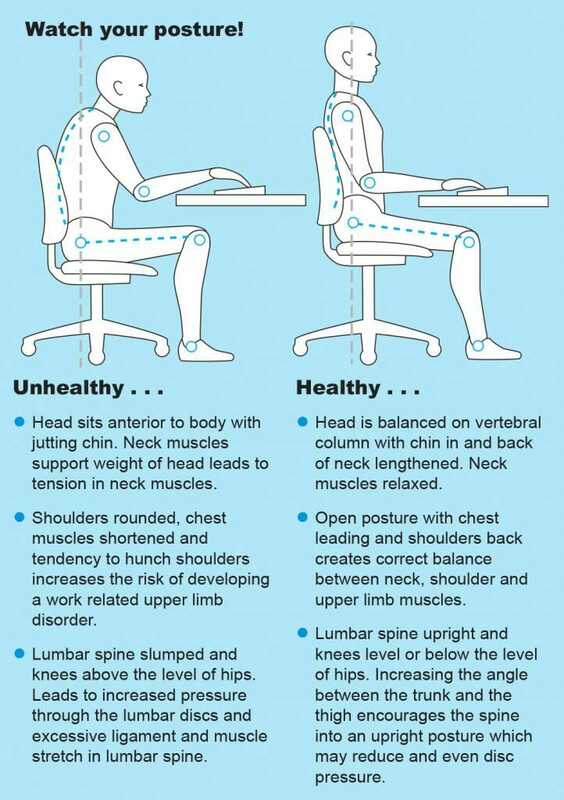 Chairs that can be set up to allow movement and variation in working posture are highly recommended. All persons must be properly trained in how to use all the adjustments on the chair and must be encouraged to use the adjustments to change positions frequently throughout the day. First, set up your chair using the information provided. The middle row of the keyboard should be level with the elbow (forearms parallel or slightly sloping downwards). An upward slope has the potential to cause problems with pressure points on the forearms or persistent shrugging of the shoulder girdle leading to neck tension. 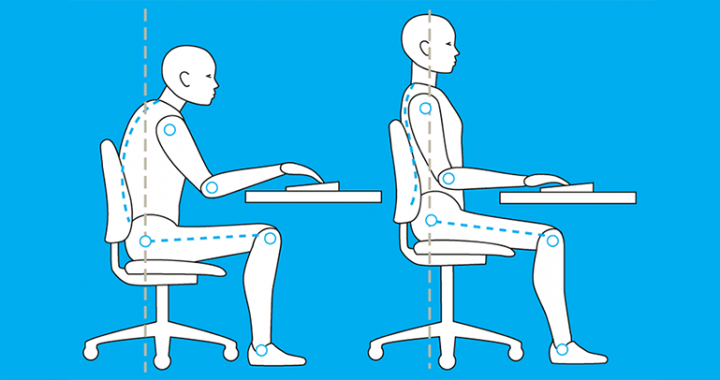 Ideally, the desk would be motorised to allow constant changing of posture between sitting and standing. The desktop should not be cluttered and allow plenty of space for all of the equipment. The recommended viewing distance is between 50-100cm, you should be able to read all the text easily with the head and trunk in an upright posture and the spine fully supported on the back of the chair. The top tool bar of the screen should be at eye level or below. The screen should be tilted so that it is perpendicular to the line of sight. If experiencing eye problems or you are a non touch typist there may be justification for having the screen in a lower position. Position the screen at ninety degrees to any light source avoiding glare and reflections. or as close as possible to the side of the screen. Different types are available according to whether paper documents or files need to be supported. Allow sufficient space in front of your keyboard to rest your hands when not typing. There should be no over reach on the keyboard or mouse. A standard keyboard is approximately 45cm wide with a numerical pad sticking out to the right which forces a right handed persons arm away further from the body. A solution is to provide a shorter keyboard 30 cm without the numerical pad. If experiencing pain in left or right side it may be advisable to change the mouse over to the other arm and use the control keys to ‘share the load’, or vary your input devices. A large selection of input devices is available and it is important to get the right one. Wrist or palm rests are not usually required and should only be used when resting the wrist and not when inputting data using the keyboard or mouse. Movement should be free flowing from the upper limbs and not isolated to the wrists. The hand should be in line with the forearm and upwards or side bending movement of the wrist avoided. Cradling the telephone between the neck and shoulders can cause severe muscle tension. If you regularly use the telephone consider a headset. Varifocal lenses are such that the screen is viewed through the bottom of the lenses which will cause the head to tilt back. The screen will need to be placed lower to accommodate this or single vision lenses will need to be provided for screen use. Enforced static posture is bad. With office related musculo-skeletal disorders on the increase, it is now widely appreciated that movement has to be introduced into the office scenario. It is often said that . . .
Take mini breaks regularly - at least hourly. Use this time to stand up, move around, change posture and maybe do some of the exercises shown opposite. Keep mouse and telephone within easy reach, alternating between the left and right side may help alleviate tension in the neck and upper limbs. If you have a free float or recline mechanism on your chair, use it to regularly change your position. This will have the effect of maintaining tone in the trunk muscles, improving circulation, breathing and alertness. If you have an electronic height adjustable workstation, use the opportunity to sit, perch or stand whilst continuing with your office work. If you have a fixed height desk try to stand up whenever possible. e.g. when on the phone, talking to colleagues. Regularly look away from your screen and focus on objects in the distance to try and prevent eye strain. Be fit to work. Exercise regularly! Attend the gym or an exercise class such as Pilates and/or make the effort to walk or cycle to work. A conditioned body is much less likely to get aches and pains. Put the heel of your hands into your lower back. Draw your elbows back and down. Keeping your head and neck steady with chin tucked in, lift your chest towards the ceiling. Take a deep breath, hold for 5 seconds and then relax. Place one hand on the edge of the chair for support with the other hand reach up to the ceiling and over the head and lean the trunk towards the supported hand. Hold for 5 seconds, repeat on other side. Grasp the elbow of one arm with other hand, pull arm across chest to opposite shoulder to stretch the back of the shoulder. Hold for 5 seconds, repeat on other side. Turn your head to the left and right, keeping your chin in and aiming your chin at your shoulders. Hold for 5 seconds each side. Sitting tall, imagine you are suspended by a piece of string from the crown of your head. Keeping eyes level with the horizon, tuck your chin in to make a double chin. Hold for 5 seconds, repeat 3 times. Gently interlock your fingers, palms facing away from you. Press your palms away from your body, gently stretching the forearm muscles, fingers and muscles between the shoulder blades. Hold for 5 seconds. Keep your shoulders back and lift them towards your ears, breathing in slowly. Tighten the muscles in your shoulders and hold for 5 seconds. Breathe out as you drop the shoulders. Repeat 3 times. Stand upright facing open doorway in a stride position. Place your hands on the door frame so they are level with your shoulders. Lean body though doorway, leading with the chest and keep your chin in. Hold for 5 seconds. If you have a pre-existing musculo-skeletal disorder or medical condition it may be advisable to discuss these exercises with a medical professional before starting. Posted in Ergonomics, Exercises, Stretches. "London City Physiotherapy are family to me - they fix me when I’m broken, putting me back together again when I feel it is an impossible task; they have looked after me for over a decade with dedicated and relentless care in all aspects of the most challenging physiotherapy, using this in combination with Pilates and massage - I would use no-one else as they are quite simply the best."